"They closed the Faculty of Law for teaching the 'man-made law', which is, in their view, explicitly anti-Islamic," writes this Derna-based researcher, who writes under a pseudonym for security reasons. The Islamic State in Libya (ISIL) is in control of the occupied city of Derna. They are deciding and implementing what comes to their mind without considering the desire of the people here. On October 31th 2014, the Islamist militants pledged allegiance to “caliph” Al-Baghdadi with the sounds of chanting and applause among a large crowd of supporters in Derna. While events have escalated within the corridors of the city, the Libyan government and parliament avert their communiqués and give secretive statements to the residents of Derna. The Shura Council of Islamic Youth SCIY, a group of radical Islamists, took advantage of the security vacuum and has started to enforce new customs. On October 4th, an armed motorcade belonging to the SCIY drove across the city with convoys of black-clad fighters brandishing the banner of the Islamic State. A few days later, they established their headquarters in Derna, including an Islamic Grievance Court, Islamic Police and Diwan Al-Hesba (Committee for the Promotion of Virtue and the Prevention of Vice). They have formed offices for education, health sectors and Awqaf (Mofti Office), which have already begun to work to scrutinize the governmental sectors in Derna. ON OCTOBER 22ND, the Principle of the Education Office in ISIL visited the head of the education sector in Derna, Mr. Attia Ben–Nasser and asked him to start separating between the pupils inside the educational institutions, as well as to stop teaching blasphemous courses like physics, chemistry, biology, geography and languages. Furthermore, ISIL asked (demanded) to teach Islamic Sharia instead of the existing religion curriculum. Yet, ISIL was not satisfied with its achievements, therefore, on October 26th they closed the Faculty of Law for teaching the “man-made law”, which is, in their view, explicitly anti-Islamic. The group then ordered all those who were associated with this faculty to come and declare their repentances in front of the Islamic judiciary. The announcement of the group’s allegiance to ISIS has angered the international community and raised concerns about the ISIL presence in North Africa, close to the Mediterranean countries. The Italian newspaper Republic stated that Bernardino Leon, the head of the United Nations Support Mission in Libya, has informed that ISIS jihadists are already present in the country and are awaiting their opportunity. He is quoted as saying: “If a real political dialogue does not start in Libya soon, there is only one thing that will be certain: the country will be an open field for Isis”. Mohamed Eljarh, a Libyan scholar and fellow at the Atlantic Council’s Middle East center, explained in Financial Times that Derna is run by “a collection of Jihadi militias”. It includes Ansar al-Sharia, the Abu Salim Martyrs Brigade, the Sahara Brigade, which counts jihadists who battled in Syria among its members, and the Islamic Army. Some of them pledge allegiance to ISIS. Libyan Prime Minister Abdullah Al-Thani did not condemn in his statements what is now happening inside the commandeered city of Derna by these extremist gangs, nor did the Libyan Parliament, which instead conveyed a sense of hopelessness and frustration to the city’s residents. HOWEVER, the retired General Khalifa Hifter managed to, through his Dignity Camp in Benghazi and Derna, reduce the growing concerns after launching initial attacks targeting the headquarters of the Islamist groups. “The echo of air strikes rang like a symphony, tickling the hearts of Derna’s people with gaiety for having a Libyan leader who still remembers the blocked city,” said Ali Jomah, a retired teacher. The continuation of air strikes on Derna and specifically ISIL sites and their allies made Operation Dignity gain a lot of supporters who finally came over their fear. 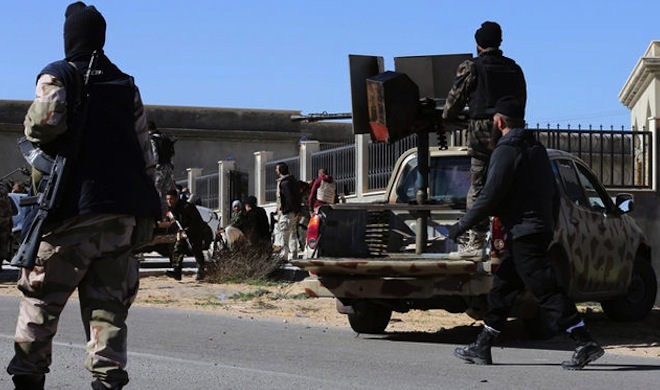 In the western part of Libya, an armed group started what is called Operation Dawn, seizing the Libyan capital of Tripoli and declaring the formation of a shadow government there in August. Omar Al-Hassi, declared as its Prime Minister, addressed the international community and the Libyan people by emphasizing the illegality of the previous parliament, which had gained international recognition under Prime Minister Al-Thani. The succession of assaults and proxy battles in Tripoli is a clear retort to general Hifter’s self-promoted Operation Dignity, which begun in Benghazi two months earlier. Some Islamists who are in Benghazi, even somewhat moderate ones, describe the moves of Hifter as a repeat of Qaddafi’s attack on the Libyan Islamic Fighting Group in 1990-1996. As the House of Representatives (HOR) and the Al-Thani government, based in the eastern city of Tobruk for security reasons since August, gave Hifter legitimacy to fight terrorist groups in the country, Operation Dawn became classified as an official target as well, forcing the Muslim Brotherhood who centered in Misrata to recalculate their situation and seeking to reclaim their political presence by force. They occupied ministries, took over official governmental websites, and attacked the brigades of Alsawaqa and Alqaqaa, who work under the command of the new chief-of-staff in Tripoli, Colonel Abdul Razzaq Al-Naduri. The Generals in the western part rejected the appointment of Al-Naduri by the parliament as the chief-of-staff and explained that they will not work under an officer who supports Dignity operations and the military zone of Tobruk, claiming that the surrounding areas are outside the chief-of-staff’s authority. THE LEADERS of Operation Dawn are working to establish a firm base in the east of Libya to fight the pro-Dignity operation in Benghazi – and Derna is their last chance. They are trying to engage in dialogues with the Islamist groups and support them in the coming war. As a prelude, Omar Al-Hassi described Ansar Al-Sharia as an advocacy and reform group. Their support for Wessam Ben Ahmaid and Al-Zahawi, who are famous Islamist leaders in Benghazi, will create a huge opportunity to cooperate with the radical Jihadists in Derna. ISIL will take advantage of this opportunity to increase its power. The scenario now is really complicated. The shadow government in the western part of Libya will use all tactics available to win the war against Hifter – even if that means cooperation with ISIL.